A Shaggy Fish Story from Waterlog Magazine. The sign at the lodge gate says ‘Priorywood Retirement Home’ but this thirty-five acres of rolling countryside with its stately mansion, is known locally as ‘Whisperer’s Hall’. The security check is friendly enough, but there is a professional thoroughness when the contents of one’s car boot are examined, and you’re told that the use of any photographic equipment is strictly forbidden. There is no way of approaching ‘The Hall’ at anything less than a few miles an hour as speed bumps inhibit progress every hundred yards or so. On my visit, glancing left and right, I noticed that the livestock in the fields on either side were not always behaving ‘normally’. An old lady, surrounded by ten enormous bulls was having an intense conversation. A little further on, a gentleman in a deckchair was surrounded by a flock of sheep and laughing heartily at some ovine joke! Half a mile before the entrance to the hall, there was a vast chicken run, the inhabitants of which were gazing attentively up at a cockerel perched on the arm of a gentleman in tweeds who seemed to be explaining some complex problem. “Absolutely not,” I replied, my mind racing back to my research and those old press clippings. At last there he was. Cyril Limpet, the legendary Fish Whisperer. behind him was Jason his carer, with a limp but protective hand on Cyril’s shoulder. and minced out of the room. 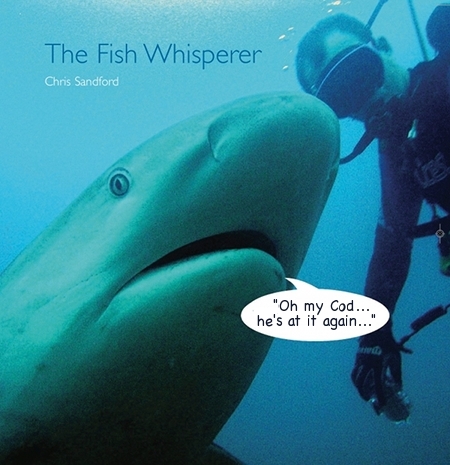 “They call you a Fish Whisperer but do you actually speak to fish?” Cyril smiled. “Well that’s the fifty thousand dollar question isn’t it? “People don’t realise that most ‘Whisperers’ don’t say a word, they just have the knack of understanding what an animal is ‘saying’. He took a deep breath and a calm seemed to settle over him as if he was about to free himself of a troublesome burden. “Bridlington,” he said with a far away look in his eyes. “Lovely spot in those days. Not many knew that about two miles out and only twenty or thirty feet down, there was a population of squid. I happened on them by mistake. They were right chatterboxes!